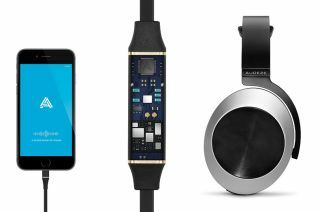 Audeze unveils EL-8 Titanium headphones with 'fully integrated Apple Lightning cable' | What Hi-Fi? The new Titanium version of the EL-8 headphones are closed-back and hook up to an iPhone via a Lightning connector to support high-resolution audio. Audeze has used an exclusive ‘cypher cable’ with an integrated amp, DSP and DAC, which supports 24-bit hi-res audio. The unit on the cable doubles up as a microphone and is Siri compatible, and a 3.5mm cable is available for use with non-Apple devices. Audeze also has balanced cables for Astell & Kern, Pono and Sony PHA-3 players. Inside the ear cups you’ll find 100mm planar magnetic drivers, which Audeze says has the largest surface area of any headphone in its class. The EL-8 Titanium should be available in January, with UK pricing to be confirmed. Audeze has also said the EL-8 will be the first of several models in the range. Apple has recently filed a patent for a new D-shaped headphone jack and for AirPodswireless earphones, suggesting that it is looking at new ways of using headphones with the iPhone. The introduction of another pair of headphones using the Lightning connection - following the Philips M2L - only fuels those rumours.